I just got home from my fourth annual trip to Indianapolis for the half-marathon. I've walked it the past three years, and this year was my first year RUNNING it. It was fantastic!! Hopefully I can remember all the details (there was a lot of drinking, haha). Eli had a Mother's Day tea party at school, so I wanted to make sure I could go to that before we left for Indy. I went to the tea party and Eli was adorable. He was so excited and proud of the things he'd made for me. My mom picked him up at 11:30, and I left with Jerry (my husband), Renee, and Jessica (my friends) for Indy. The drive was about 4 1/2 hours, and we stopped a couple of times along the way for snacks. At one gas station, they were selling Cadbury Creme Eggs for 6 cents each!! I was tempted to buy all of them, but I only bought two. We arrived at the hotel and my brother Brian, my sister Jeanie, and her two friends Cathy and Jen were already there. Everyone had a drink in our hotel room while we waited to head to dinner. We had reservations at Buca di Beppo to load up on pasta for the race. Reservations were at 5, and we were seated right away. We had cheese bread, lasagna, fettuccine alfredo, ravioli, stuffed shells, manicotti... OH, it was SO good. Then we headed over to the Expo to pick up our packets. I was kind of bummed to see that I had requested a medium shirt, when I really need a small, but I registered for this race almost a year ago, and I was a medium at the time. We walked around the Expo, and I bought a sticker for my car that says "13.1 miles 'cause I'm only half crazy". I noticed someone walking around in a Biggest Loser t-shirt and I recognized it to be Allen from season 8! I said hello, and asked if he was doing the race, etc. I told him about my weight loss and asked if I could get a picture with him. He was SUPER friendly. After the Expo, we went back to the hotel. I was kind of wired and wanted to play some games or something, but everyone else just wanted to lie around and go to bed early. I sat in my sister's room and talked to her and her friends for a little while, then went to bed at around 11. The alarm went off at 5:00 AM. I went down and ate breakfast (oatmeal with raisins, canteloupe, muffin). Then I got dressed and tried to calm my nerves. I get nervous every year, even though I already know what to expect. We took some pictures, then everyone headed down to the start area, which was directly in front of our hotel. I was in the Q corral (by myself--no one else from our group was starting there, and I planned to run alone). Jerry wasn't running, so he had all our stuff in a bag and he was going to go wait at the finish line. I made small talk with a couple of people, turned on my Garmin, and waited for the start. Once the race started (at 7:33), it took me about 20 minutes to get to the actual starting line. This is the largest half-marathon in the country, with 35,000 racers--and being in Q, I was pretty far back there. It's organized by estimated finish time, and when I registered, I had estimated my finish to be 2:30. I kept focusing on maintaining a steady pace, and I didn't want to worry too much about how slow I was going. I wanted to stay comfortable, so I just found a happy pace and went with it. At mile 6, we went onto the Indy 500 race track. The track looks so small on TV, but it is actually 2 1/2 miles around. It's the most boring part of the race, in my opinion. I saw a man wearing a Martian Marathon t-shirt and I told him I did the Martian 10k in March. He is from Windsor, and went to Indy for the race like I did. There were tons of pit stops along the race (probably about every mile) but I hadn't stopped for water or Gatorade at all. At around mile 8, I had some water--I didn't realize it would be so hard to run and drink at the same time, and I wound up getting water all over my shirt right before I saw the photographers. So I'm interested to see how I look in the pics! After mile 9, the rest of the miles went by kind of fast. I had water at mile 10, and then Gatorade at mile 11. Most people eat some sort of fuel, but I always feel fine without food or water up until about 10 miles, and after that, I just need a little water and I'm good to go. My legs started hurting about halfway through mile 12, but I still felt pretty strong. 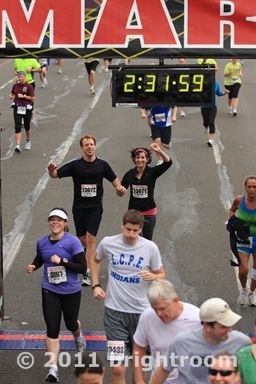 When I finally hit mile 13, I saw the finish line and there were TONS of people cheering us on. I heard Renee yell my name, so I smiled and waved at her. I didn't see Jerry at all, and I actually slowed down a little to try and see him, but no luck. 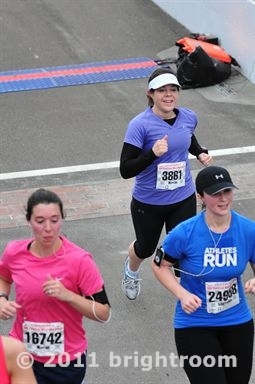 I think I was half smiling, half crying when I crossed the finish line. I felt emotional for a minute and was about to go into the ugly cry, and then I was over it. My finish time was 2:10:40. I got pic taken with my medal, then went to find Renee (who finished in 1:46) and Jerry. For the most part, I had negative splits, so I'm happy with that. My best mile was actually the 13th mile, which surprised me. Renee found me and she said she had no clue where Jerry was. We went back to the finish line to watch everyone else finish. I saw Brian and Jen cross, which surprised me, because I thought for sure they would have finished before me. Their time was 2:19. We watched for Jessica, but didn't see her. We saw Jeanie and Cathy cross. Then someone found Jerry, who admitted he completely missed my crossing the finish line! We went back to the hotel and met up with Jessica. I took a shower and had lunch at the food court in the mall next door. Then I drank almost a whole bottle of Kendall-Jackson Merlot (my favorite wine!) and relaxed. After that, we went down to the hotel bar and had some drinks and snacks. Renee and Jessica ended up going out to a club to dance, which I wasn't interested in doing, so I stayed with everyone else. We went to Buffalo Wild Wings for dinner--that's where you end up if you don't make reservations on time--and then finally went back to the hotel. I went to bed at around 10:30. I couldn't sleep at all, and at 3:30 AM, Jessica and Renee finally came back to the hotel. They were being pretty loud, so I went in the other room to sleep. I could tell I was getting sick because my throat felt like I was swallowing razor blades. I woke up at 8 this morning and packed up our stuff. My throat hurt so badly. Surprisingly, I wasn't sore from the run at all. My hips felt a little stiff, but that's it. We left the hotel at 10:30, and I got home at about 3 pm. I looked up my results online. My kids asked if I won, and I explained that I came in 11,890th place... hahaha. I'll post the official race pictures when I get them. Here are the pics!! At the halfway point. The famous bricks on the Indy 500 track. It poured rain the last mile or so. See how wet I am? Congrats on your accomplishment, that is sooooo awesome for you. I hope your proud of yourself cause I am!!!!!!! 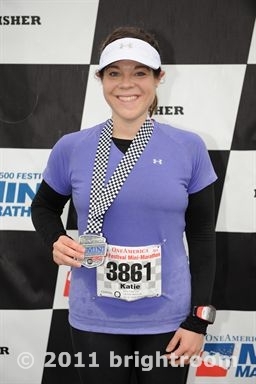 LOVE to read about your experiences every year at the Indy Half-Marathon. It sounds like you always have a wonderful time and to RUN the whole thing this year--what an amazing accomplishment. Way to go Katie!! Hey! My brother ran this too :) Glad it was so great for you. AWESOME! Wow! Congrats! You such an inspiration! Great job and what a great experience!! !